What Day Of The Week Was January 9? 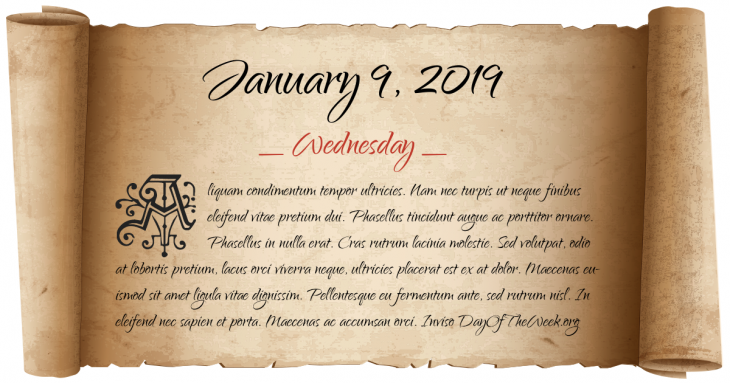 January 9, 2019 was the 9th day of the year 2019 in the Gregorian calendar. There were 356 days remaining until the end of the year. The day of the week was Wednesday. Byzantine Emperor Zeno is forced to flee his capital at Constantinople, and his general, Basiliscus gains control of the empire. Invading Jurchen soldiers from the Jin Dynasty besiege and sack Bianjing (Kaifeng), the capital of the Song Dynasty of China, and abduct Emperor Qinzong and others, ending the Northern Song Dynasty. Hallam Tennyson, 2nd Baron Tennyson, son of the famous poet Alfred Tennyson, becomes the second Governor-General of Australia. Who were born on January 9?